After many years of rumour and conjecture, finally a viable population of the legendary Night Parrot has been located in the region of the Diamantina National Park in central Queensland. The initial discovery was made back in 2008 by the now famous naturalist John Young after years of searching. Since that time a research programme has been established, thanks to the generosity of Andrew Forrest of Fortescue Metals, and a 56,000 Ha. nature reserve known as the Pullen Pullen Reserve has also been put in place by Bush Heritage Australia. 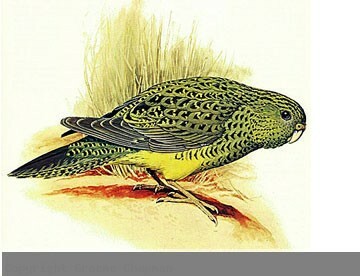 Back in the 1800's before the impact of grazing had made its effect on the arid zone, Night Parrots were fairly widespread in inland Australia, extending as far south as northern Victoria, the Gawler Ranges in S.A. and the goldfields of W.A. but in recent times, most credible records have come from northern Australia, above the latitude where foxes and rabbits occur. At present, on the basis of possible records in the last ten years or so, there appear to be a couple of "hot spots" for Night Parrots in Australia. 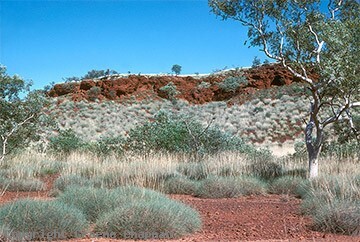 In the east, an area surrounding The Diamantina National Park in central Queensland, possibly extending north almost to Cloncurry and in Western Australia an area of the north-east Pilbara, centred around Nullagine and north to about Lake Mackay and in particular around the headwaters of the Oakover River. Further discoveries are continuing, in the east. More Night Parrots have been detected in both Diamantina and Goneaway National Parks in Qld, not surprising really as they are not far from Pullen Pullen Reserve. However they have also been seen, heard and photographed in Western Australia at a presently undisclosed locality not far from Wiluna. 312507 ... 60 km S of Nullagine where I heard what sounded like Night Parrots in March 1982.